Mandala means Sacred Circle in Sanskrit. Prior Art-making Not Necessary, Only Open-Heartedness! This workshop invites you to experience and express the "Circle of Light" inherent in all life. You will receive and allow your own unique luminous mandala vision to manifest, and your heartís beauty will be reflected back to you on paper and through the "living mandala" of our human circle, the group. Movement, ritual, writing, singing and sound practices, along with walking the labyrinth, will be the vehicles for embodying our personal and collective exploration of de-Light! Registration fee includes art supplies. Julia Weaver, LMFT, BFA, CMT is a licensed psychotherapist, artist, and the founder of Art and Soul, a California-based resource center for sacred and healing arts, embodied psychotherapy, cross-cultural spiritual practice, and Irest. She also offers Awakening the Heartist Within workshops worldwide and dolphin swim retreats in Hawaii. 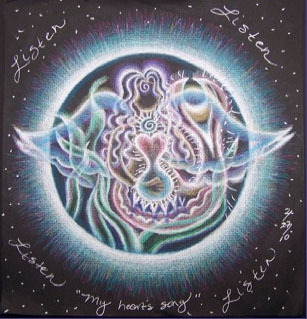 In 1996, while swimming off the Kona Coast, Julia had a mystical experience, spontaneously receiving mandala images, taking her artwork and teaching into deeper dimensions of healing and spiritual practice. A widely collected artist, her work has been featured in New Age Journal, Mandalas, Journey to the Center, and Artists Envisioning The Divine. Julia's passions include facilitating sound healing, rites-of-passage ceremonies, community revitalization and ecological healing. Through her mandala workshops she invites people to experience and express the light and beauty inherent in themselves and all of life. 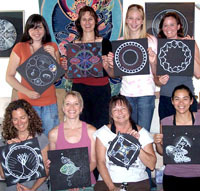 Lisa Winston is a founding member of the Colorado Labyrinth Community, and mystic-in-training at PathFinder Workshops. Through individual sessions and group workshops, Lisa acts as a guide, combining her passion for esoteric wisdom traditions, subtle body energy work, and photography, helping others Discover, Awaken and Align their creative and life-force energy reserves. Lisa is also a fine art photographer.